I remember reading Harry Potter and Dumbleore said "Death is but the next adventure". Well I'd hate to break his bubble, but Death is not an adventure. All it is is a process which takes you to the other world where you can sit down and have a sandwich with Elvis or talk art with Michelangelo. Death isn't an adventure; it's just the beginning of a more relaxing period of eternity. Verdandi Brooks is just your normal twenty year old. She likes to go out with friends, go see a movie or two and she SOMETIMES gets along with her family. Oh and now she's Death Apprentice. 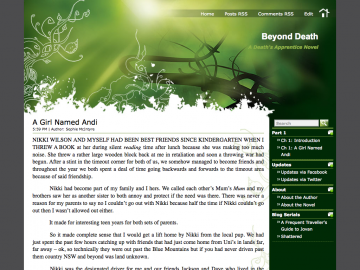 After dying, Andi i given a choice of either spending the rest of her life in Heaven or she can help Death, who has been feeling a bit run down and is thinking of retiring in the next hundred years or so. Beyond Death: A Death's Apprentice Novel has not been tagged yet. Help others find Beyond Death: A Death's Apprentice Novel by tagging it! Beyond Death: A Death's Apprentice Novel has not been reviewed yet. Beyond Death: A Death's Apprentice Novel has not been recommended yet.